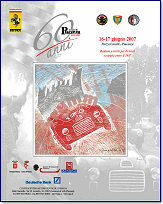 We plan to invit about 20 Ferrari (built betwenn 1947-1960) and some cars that had raced at Circuito di Piacenza like Maserati A6GCS first type, BMW 328, Lancia Astura Mille Miglia and a lilliput Fiat Topolino �special� 500 and 750. Elio Zagato and Nuccio Bertone two of the coming top designers had raced two Topolino Special. The best news is that Saturday evening the �real old� 3 Km Circuito di Piacenza (in the middle of the city�) will see it's revival, the street will be closed for normal traffic and will be opened for some demonstration lap �. The Ferrari 125 S was not fortunate it had to be stopped on the penultimate lap for mechanical failure, when it was in the lead. But 14 days later on May 25th it won it's 1st race at the GP Roma driven by Franco Cortese. That day, in the smaller category �Formula 750� two young pilots made their debut, they will later make history of the automotive design: Elio Zagato and Nuccio Bertone. Ferrari Spa will be present with his 125 replica and a 166 berlinetta superleggera.